Upstream supply chain sources of DigiTimes claim Apple will be shifting a major portion of its MacBook orders to Foxconn in 2018, instead of providing the majority of its orders to Quanta Computer. Foxconn is apparently expected to start fulfilling the new orders with mass MacBook Pro shipments in the second quarter, according to the sources. Even though Foxconn will allegedly see more MacBook orders this year, it is believed Quanta will continue to be Apple's biggest MacBook supplier for the year. DigiTimes' research indicates that Quanta has shipped four times as many MacBooks as Foxconn over the last five years, with Quanta taking 79.5 percent of orders in 2017 compared to Foxconn's 20.5 percent. 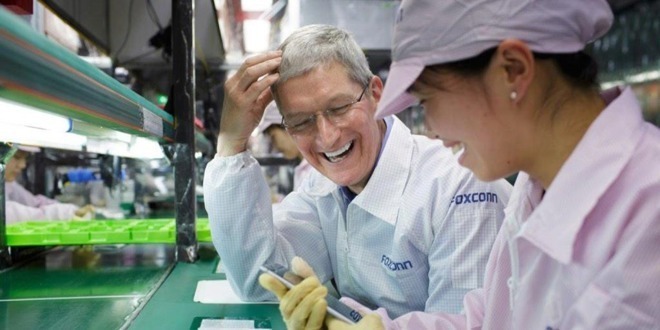 Foxconn has reportedly been aggressive in attaining more MacBook orders from Apple over the last few years, offering highly attractive quotes to tempt Apple its way. Signs its tactics were working surfaced in late 2017, after Apple started outsourcing some of its MacBook assembly to a Foxconn plant in Shenzhen, China. Midway through the report, the sources make the claim that Apple has no plan for a major upgrade to its MacBook product line. This is apparently used as a justification to shift mass production orders to Foxconn, with the ultimate result of reducing costs and production risk. While the report may be right about a lack of a major MacBook Pro in the near future, considering the four-year gaps between the second, third, and fourth generations, it is still entirely plausible that Apple could make considerable changes to the internals while keeping the main chassis of the hardware largely unchanged. Apple does typically refresh its lines with new components during the generation, adding new processors and other upgrades to the mix. It is arguable that Apple has more incentive to update its notebook lines sooner than later. Revealed earlier this month, the Meltdown and Spectre chip flaws included in Intel processors could warrant a change in chip to a new model constructed without the flaws, which pose a security risk to consumers and businesses alike. Apple may also want to adopt Intel's new Titan Ridge chipset for Thunderbolt 3, an upgrade that would enable DisplayPort 1.4 connections, allow 8K screens to run at 30Hz without compression, and a fallback to USB 3.1 speeds if a connection does not involve a Thunderbolt 3 host. There is even the outside chance of Apple adopting a whole new type of processor. Intel recently launched G-series processors that combine an Intel CPU with an AMD Radeon RX Vega M GPU, effectively providing all the power of a discrete GPU on one physical chip while saving space and weight.